Matcha Elephant Ivory White (Kenya) - 1.5 oz. Contains ultra-high antioxidant level 19.15% vs 5-6% for mass-market teas. Character: Crisp and flavory, yet smooth. The tea used to make this innovative new Kenyan tea is grown at high altitude under bright sun and as such is packed full of antioxidants, polyphenols and exceptionally crisp flavor. Only the youngest leaves are plucked, processed and carefully ground using a traditional Japanese-style stone mill to an exceptionally smooth consistency. The resulting cup is thick and rich with deep ground grassy notes. A 40g bag should make 20-25 cups (e.g half a teaspoon per cup). A fabulous tea for those looking for an interesting brew with exceptional health benefits. Because Matcha consists of stone ground leaves it contains, by volume, higher concentrations of catechins, vitamins and L-theanine which is linked to increased alpha brain wave production and is considered a natural antidepressant, stress reliever and energy booster. 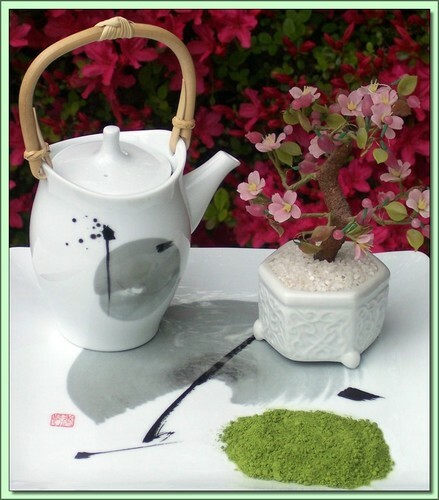 Matcha contains approximately 10 times the polyphenols of regular teas. Grown with no pecticides needed/used due to high altitudes.